The third-generation 2013 Audi RS4 Avant come with base price of €76,600 in Germany and scheduled to begin in fall 2012. New 2013 Audi RS4 Avant polished 19-inch, ten-spoke forged aluminum wheels shod with 265/35-series tires are standard. Audi also offers 20-inch wheels with 265/30-series tires. These are available in a new, polished, titanium-look, five-V-spoke design plus two additional variants in the five-arm rotor design. The calipers 2013 Audi RS4 Avant are painted high-gloss black; the front calipers have eight pistons each and sport RS logos. The ESP stabilization system has a Sport mode and can be fully deactivated. The ceramic brakes are especially lightweight, robust and durable. New 2013 Audi RS4 Avant comes with LED daytime running lights encircle the xenon plus units like a clasp in the wedge-shaped headlights. The distinctive bumpers and the two oval tailpipe caps of the dual exhaust system dominate the rear end and are integrated into an upturned diffuser. Audi also offers a sport exhaust system with a voluminous sound and black caps for 2013 Audi RS4 Avant. Elegant light strips adorn the LED rear lights. 2013 Audi RS4 Avant is 20 millimeters (0.79 in) longer and 24 millimeters (0.94 in) wider than the A4 Avant, but 20 millimeters (0.79 in) lower. A choice of eight colors is available: one solid and one metallic finish, four pearl-effect colors and the two specially pigmented crystal-effect colors, Prism Silver and Panther Black. Interior the 2013 Audi RS4 Avant comes with completely in black. Chrome clasps subtly accentuate switches and control elements. Carbon inlays are standard, with brushed matte aluminum, Aluminum Race, black piano finish or a light stainless steel mesh available as options. The standard heated front sport seats Audi RS4 Avant with integrated headrests are power adjustable and covered in a combination of black leather and Alcantara. Fine Nappa leather in either Black or Moon Silver accentuated with Stone Gray piping is optionally available. The pedals, the footrest, the air vents, the shift paddles on the steering wheel, the MMI buttons and other controls shine in an aluminum-look finish. Audi offers exclusive high-grade leather packages for all seating options, including a design package with honeycomb quilting for the RS4 bucket seats. Rounding out the list of optional equipment is a broad range of state-of-the-art driver assistance and communication systems, including the Bluetooth online car phone that connects the 2013 Audi RS4 Avant with the Internet. Engine specifications the 2013 Audi RS4 Avant combines potent performance with a high level of everyday practicality. It’s 4.2-liter V8 produces 331 kW (450 hp); the seven-speed S tronic and quattro permanent all-wheel drive transfer that power to the road. The 4,163 cc powerplant produces 331 kW (450 hp) at 8,250 rpm for a specific output of 108.1 hp per liter. Its maximum torque of 430 Nm (317.15 lb-ft) is available from 4,000 to 6,000 rpm. The responsive V8 with its red-painted cylinder head covers accelerates the 2013 Audi RS4 Avant from zero to 100 km/h (62.14 mph) in 4.7 seconds on its way to a governed top speed of 250 km/h (155.34 mph). This can be increased to 280 km/h (173.98 mph) upon request. Hand-built at Audi’s plant in Györ, Hungary, the 4.2 FSI engine combines its impressive power with exemplary efficiency, consuming on average less than 11 liters of fuel per 100 km (21.38 U.S. mpg). The standard seven-speed S tronic 2013 Audi RS4 Avant also contributes to the vehicle’s good fuel economy. Drivers can let the lightning-fast dual-clutch transmission shift automatically or change gears manually using the selector lever or the paddles on the steering wheel. The 2025 Bugatti Aerolithe Concept is the work of Douglas Hogg, a Coventry graduate. The design draws its inspiration from the original Bugatti Aerolithe concept showcased at the 1935 Paris Motorshow. The old Bugatti Aerolithe concept was also the inspiration of the Atlantic 57SC. Designed 75 years after the original Aerolithe was launched in Paris, Douglas Hogg has introduced the modern interpretation of the design. The car looks quite futuristic, despite being based on a design that was made quarter of a century back. Hogg suggests that he has used a minimalistic approach in pure surfacing for the design and applied a principle of Ettore Bugatti for Automotive design. The car design represents simplicity, elegance, and intelligence. The design follows a smooth flow, uncluttered by door handles, external mirrors or spoilers. It's in complete harmony with advanced aerodynamics. The underbody aerodynamics are an important feature of the design that allows two air channels to traverse the entire length of the body, funneling air from the front of the body to the diffuser at the rear, producing enough down force in the process to keep the car glued to the tarmac at high speeds. Some of the key features of the design include aeronautics inspired split canopy doors, split windshield, pronounced windows, bullet proof windows, lightweight construction material and Bugatti's signature front grille. The car is powered by a Microturbine-battery hybrid powertrain. Microturbines do not power the wheels directly and merely function as a generator to charge up the batteries on the run and acts as a range extender for an otherwise purely electric vehicle. A single fill of the tank can make this car run up to 800 miles. The Bugatti Aerolithe design is a great concept that showcases the design elements that may inspire the cars of tomorrow. It's a great tribute to Ettore Bugatti, who was way ahead of his time when he launched the first Aerolithe. From Mazzanti Automobili in Italy comes the F&M Evantra, to be released in mid 2012. This limited supercar series will be produced at a rate of only five models per year. The customization and production of each model for its client will be personally supervised by the car's builder, Luca Mazzanti. The F&M Evantra derives its name from an ancient Etruscan goddess, and was formulated by Hungarian car designer Zsolt Tarnok. The Evantra is a mid-engine super car, meaning the engine is mounted nearer to the center of the vehicle. This engine layout more evenly distributes the engine weight on all four wheels, and makes the vehicle faster and easier to turn. The body style of the Evantra is a two seat coupe. The car buyer will decide how the body will be constructed from one of two different options. The first option is called PRO-BODY, and will use all composite materials for assembly. The second option is called ONE-BODY, and will be an exclusively hand-crafted aluminum body which can be thoroughly personalized by the buyer. The engine and body will be combined on a light-weight steel chassis. The outer lines of the Evantra have the popular symmetries of many mid-engine sports cars, and the profile curves are smooth and classically molded. Several stylish details, and a mixture of concave and convex surfaces, express a distinctly competitive nature bordering on hostility. The doors open outward and upwards making for very easy entry and exit of the vehicle. All in all, the 2012 F&M Evantra supercar is a very beautiful and sleek rocket on wheels. The Evantra features a mid-mounted 3.5-liter flat-6 engine. Customers can select from two different engine designs, a naturally aspirated engine rated at 397 horsepower, or a 595-hp twin-turbo version. With a low curb weight of 2465 pounds, the 2012 F&M Evantra will be able to achieve acceleration speeds of 0-60 mph in less than 3.7 seconds according to Mazzanti. Chevrolet has launched the 427 Convertible, the latest edition to long line of Corvettes, as a farewell to the outgoing C6 model and before the introduction of the C7 in 2014. The launch commemorates the 60th anniversary of the Chevrolet brand and after more than 40 years, a Corvette is being rolled out with the legendary 427 name. The new Corvette 427 convertible is the quickest in the history of Corvette, thanks to its powerful engine and light-weight construction. The 2013 Corvette 427 collector edition will be available with the 60th anniversary package, which includes Arctic white exteriors with optional pearl blue racing stripes. The interior would be wrapped in Blue Diamond leather with suede accents. The car gets Corvette ZR1 style Michelin PS2 tires, 19-inch alloys in the front and 20-inch at the rear. The 427 has been designed to have an improved power to weight ratio and several light-weight body components have been used in the construction, like Carbon fiber floor panels, carbon fiber raised hood, carbon fiber fenders and front splitter. The Corvette 427 convertible has been fitted with a 427 cubic-inch engine (7 liters) which churns out 505 horsepower and 470 lb ft of torque. The engine has been derived from the Corvette Z06. It's the most potent engine to be installed on a Corvette. The engine has been matched to a 6-speed manual transmission and there is no option of automatic transmission. This Corvette 427 is being designed for performance. With great emphasis given to the power to weight ratio, the car churns out staggering performance figures. It goes from 0-60 in 3.8 seconds and runs a quarter mile in 11.8 seconds. The convertible has maximum speed of more than 190mph. However, with this kind of performance, the car is not very fuel efficient. Chevrolet has not decided on the number of Corvette 427s they will build, and the production numbers would likely depend on the demand of the vehicle. The company has not yet released the price of the vehicle. Bugatti Veyron is not just a super car that carries on the name of racing driver Pierre Veyron, who, while racing for the original Bugatti car manufacturer, won the 24 hours of Le Mans in 1939, Bugatti Veyron 16.4 is the second fastest car in the world and the most powerful, it can easily pass as a super hero`s car like Batman. It has the fastest acceleration speed, reaching 60 mph in 2.5 seconds. 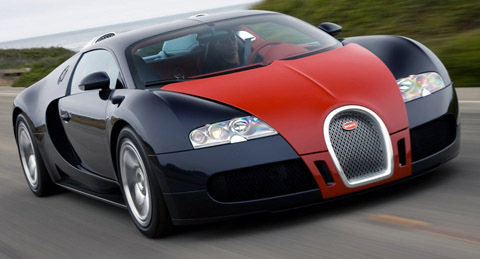 Endowed with a 8.0L W16-Cylinder, four turbochargers, and a dual-clutch DSG computer-controlled manual transmission, the Veyron can reach a top speed of 253 mph. Counting a sum of 10 radiators, for the engine cooling system, for transmission oil, a heat exchanger for the air to liquid intercoolers, for engine oil etc., the car has a power to weight ratio of 529 bhp/tonne. If we talk about performance we are dazzled by this supercars power to reach 200 and 300 km/h (124 and 186 mph) in 7.3 and respectively 16.7 seconds, wining for herself the name of the quickest-accelerating production car in history. 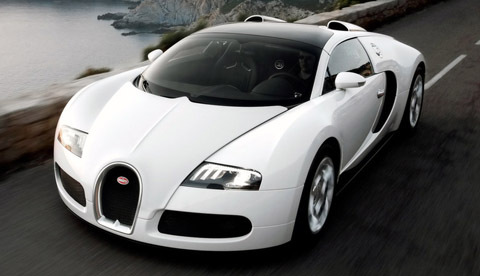 If we count the fact that the top speed of Bugatti Veyron is 253.2 miles per hour (407.5 km/h), a speed limited electronically to prevent tire damage (it can run even faster) we can understand why this spectacular car must consume 40.4 L/100 km (4.82 mpg) when it`s running at top speed and in city driving 24.1 L/100 km. The 2012 Alpina BMW B6 Bi-Turbo Convertible come with an elegant and dynamic design as well as excellent aerodynamic properties and features the latest electronic suspension technologies and comes with Drive Performance Control “electronically adjustable dampers” and Dynamic Drive “active roll stabilisation” as standard. Featuring pronounced Comfort+, Comfort, Sport and Sport+ modes, the Alpina BMW B6 Bi-Turbo Convertible transitions effortlessly from cultivated luxury convertible to thorough-bred sports car. Specific springs, increased front wheel camber and a subtle adjustment of the toe-in in conjunction with a 20″ wheel-tyre combination all serve to produce a very agile chassis set-up. The lightweight 20″ ALPINA CLASSIC wheels, with MICHELIN PILOT SUPER SPORT tyres in the dimensions 255/35 ZR20 front and 285/30 ZR20 rear, contribute significantly to the direct handling and precise steering. The high-performance brakes for Alpina BMW B6 Bi-Turbo Convertible, with a diameter of 374mm front and 345mm rear, are additionally supplied with cooling air by a specially constructed NACA air intake on the front underbody. The double tailpipes, with a slightly elliptical shape in typical ALPINA style, are designed in titanium and carry small logos that make discreet reference to the origins of the ALPINA exhaust system made by Akrapovic. Interior the new Alpina BMW B6 Bi-Turbo Convertible come with features an extensive range of standard equipment, including leather upholstery, fully adjustable comfort seats with heating system, navigation system with preparation for Bluetooth mobile phone, USB audio interface, Xenon lights and LED fog lights. Blue ALPINA instruments with high resolution information display with black panel LCD technology. A sport steering wheel, hand-stitched in LAVALINA leather. Blue illuminated entry sills with logo. Or the classic ALPINA exotic wood equipment in myrtle – an exclusive burl wood of the laurel family, which grows only on the Pacific coast of the USA. Engine the 2012 Alpina BMW B6 Bi-Turbo Convertible powered by all-aluminium V8 power plant produces 507hp (373kW) at a moderate 5500rpm, with a maximum torque of 700Nm between 3000rpm – 4750rpm. Two turbo-chargers configured in parallel, each feeding one of the two cylinder banks, with specially developed large diameter exhaust-turbines allow this engine configuration to provide both exceptional power output and an abundance of torque over an especially broad rpm range while maintaining excellent throttle response at low rpm. The systems excellent thermodynamic efficiency is guaranteed by a large-volume low-temperature inter-cooler radiator, as well as two water-toair inter-coolers placed close to the engine. Altogether this results in an impressive specific output of 115.3 horsepower (85kW) per litre and a mean total compression of 20.1 bar. Direct injection and Double-VANOS contribute to the Alpina BMW B6 Bi-Turbo Convertible class-leading consumption and emission figures 10.9l/100km (25.9mpg) and 255g/km CO2 (Combined, measured according to ECE Norm). The 2012 Ford Focus Zetec S sporty five-door bodystyle come with adds a full sports styling kit including unique front and rear spoilers with lower sill extensions and Ford Focus Zetec S 17-inch alloy wheels together with sports suspension featuring stiffened springs and dampers, aluminium-style sports pedals, rear LED tail lamps and Ford Power starter button. Engine the 2012 Ford Focus Zetec S offered with a choice of four engines including the 1.6-litre 180PS EcoBoost turbo-charged petrol engine which has a top speed of 138mph, reaches 0-62mph in just 7.9sec and emits only 139g/km CO2. Any Ford Focus Zetec S chosen with this engine or the 1.6-litre 115PS TDCi will carry the ECOnetic Technology badge, as they benefit from auto start-stop, Ford ECO mode, gear shift indicator, active grille shutter and smart regenerative charging. The 1.6-litre 125PS Ti-VCT petrol and the 2.0-litre 163PS TDCi are also available and can be specified with either manual or PowerShift automatic transmission. The 2012 Ford Focus Zetec S at £18,745 on the road is priced just £1,250 above the equivalent Zetec derivative, the additional features would add over £1,700. The Ford Focus Zetec S and Titanium are identically priced so customers can choose either sport. The new Focus Zetec S is developed specifically for UK customers. The car is essentially an open-air version of the new two-place Mini Coupe, but instead of a hard top styled after a backwards baseball cap, the Roadster wears a black fabric roof. Unlike the four-place Mini Convertible, the Roadster's roof is manually operated. Drivers simply twist a latch on the windshield frame and pull the roof back to its resting place behind the front seats. Instead of offering a pair of rear seats, the area behind the front seats is home to a shelf for carrying small items, and a 14-by-8-inch pass-through into the trunk. The Roadster is about the same length and width as the Coupe or Convertible models. Its windshield is sloped much more steeply than on other models -- 13 degrees more than the Convertible -- and it is tapered at the top to give a trapezoidal appearance from head-on. With the roof up, the Roadster has a bubble-shaped profile that reminds us of the original Audi TT. The sloping shape and narrower windshield make the Roadster slightly more aerodynamic than other Mini models. It also rides 0.75 inch lower than the Convertible. As in the Coupe, the Roadster's chassis is stiffened by grace of extra bracing in the rear of the car and reinforced rocker panels. The car has an electrically operated rear spoiler, which opens at 50 mph and retracts when the car slows to 37 mph. It provides a claimed 88 pounds of downforce at high speeds, helping improve the car's stability. The use of a manual roof, however, lowers the Roadster's center of gravity, and the car is lighter than equivalent four-seat Convertible models. Curb weight ranges from 2635 pounds for the Cooper Roadster, to 2800 pounds for the Cooper S Roadster. Nearly halfway into my one-year test, the Juke's odometer ticked passed 7500 miles. To a Juke owner like me, that meant heading to the dealer for a minor service and checkup. Nissan categorizes its recommended services under two banners based on driving severity: Maintenance Schedule 1, or checkups every 3750 miles (or three months, whichever comes first), is tailored towards those that drive their vehicles hard or in particularly dusty climates. Schedule 2, on the other hand, is for those that drive in less severe conditions and recommends dealer stops every 7500 miles (or six months). As I'm not one to push the Juke to its extremes all the time (okay, once in a while, I've been known to), I opted for the latter schedule. In doing so, Power Nissan performed a lube, oil, and filter change, and rotated the Goodyears to even out normal wear. This is accompanied by a mellifluous resonance-free exhaust note that is an unlikely aural congruence of, say, Lexus IS F and Roush/Yates Sprint Cup engine. It’s a four-way exhaust two sewer pipes astern and one per side, exiting just in front of the rear wheels. A restrictor plate in each side pipe lends the Boss federal pass-by legality, but the baffles can be unbolted in less time than it takes to read this review. It’s lucky that the rumble is so rich, because the engine is seriously loud at idle. The Boss’s suspension has likewise benefited from a lavish labor of love. Compared with the GT, it boasts higher-rate springs, a fatter rear bar, new bushings, and 19-inch Pirelli P Zeros that, at the rear, are mounted on 9.5-inch-wide wheels. What’s more, each shock offers five settings that are adjustable via screwdriver, creating the possibility of very strange chassis behavior at the hands of very strange owners. Again, is Ford brave or what? And experimenting with dampers is educational and fun and will make you feel like Parnelli Jones’s crew chief. The steering rack is electrically power-assisted and can be toggled to comfort, standard, and sport modes. We preferred standard, even at the track. The other settings felt as if they did nothing more than alter effort. No matter. The steering was ever accurate, progressive, and informative, with peerless interstate tracking. At the front, four-pot Brembos clamp onto 14.0-inch vented rotors. The pads are near-race-spec compounds, although they don’t squeal, and the brake lines have been hardened to prevent expansion. On the road, pedal feel proved sublime—fairly hard but bang-on linear—and it was a cinch to modulate braking right on the threshold of ABS. Fade? None that we encountered during nine-tenths lapping around Mazda Raceway Laguna Seca. As a dance partner in the hills, the Boss eagerly goes all bossa nova, laying down its prodigious power with surprising smoothness. The chassis felt remarkably balanced, usually neutral, leaning toward power oversteer only in the tightest turns. Despite its super-quick transient responses, it never felt nervous. This Mustang is so agile, so responsive to delicate inputs, that it makes the GT500 feel like a FedEx truck. The Boss’s grip almost always exceeds the driver’s courage. What’s more, the ultra-short-throw shifter was an ally, although its gates are so close that a clumsy upshift from second will sometimes collect fifth. Ford has forever treated its Mustangs as blue-collar contrivances of unprepossessing heritage. The cockpit thus remains dour and rudimentary, despite the Alcantara-wrapped steering wheel and faux machine-turned aluminum trim. The acres of coarse pebbled-plastic surfaces, in particular, would be (and have been) rejected in far less expensive machines, notably in Ford’s own Focus. The gaping void between the top of the rear tires and the rolled fender lips is an eyesore. The steering column doesn’t telescope. And the brake and accelerator pedals should be closer. The base Boss fetches $40,995; major options include a Torsen differential and Recaro seats (together costing $1995), plus the so-called TracKey software. If you’re headed for the track—and why wouldn’t you be?—then all are mandatory. In total, 4000 examples will be assembled, which isn’t even half of the original Boss 302’s two-year production. That sum includes 3250 base Bosses and 750 Laguna editions. We expected the Boss 302 to be little more than a marketing exercise in nostalgia, a somewhat more brutal, slightly faster GT, with alluring graphics but primitive predilections. It isn’t. Nose to tail, this feels like a whole new equine, thoroughly sorted, conscientiously massaged, the object of considerable forethought and ambition. As automotive resurrections go, this is a knockout that venerates the original Boss while embarrassing it objectively and subjectively in every meaningful measure. What this is, is the best Mustang ever.